I recently received an e-mail which made the argument that HDR is a polarizing subject in the photographic community. It led me down that road that forks and forks again and…well, you know. Are we as photographers to believe that we are (and should be) fenced in by rules? In this case the rules are about technique and processing. When photography was in its infancy, it was considered to be outside the realm of “serious art”. Now, nearly one hundred years later, it has become acceptable, but only if it fits in a certain box. So, I am having trouble coming to terms with the ongoing debate inside the photography community concerning HDR processing. I consider the ability to blend exposures to expand the dynamic range of an image to be a wonderful addition to the photographer’s toolkit. There seems to be some divisive opinion about how much processing is allowable. What bothers me about this debate is one very important consideration: CREATIVITY! If someone’s vision requires that heavy and obvious HDR look, then who has the right to tell them it’s too much? Each one of us is different; we each see things in different ways and wouldn’t life be boring if we all agreed on everything? 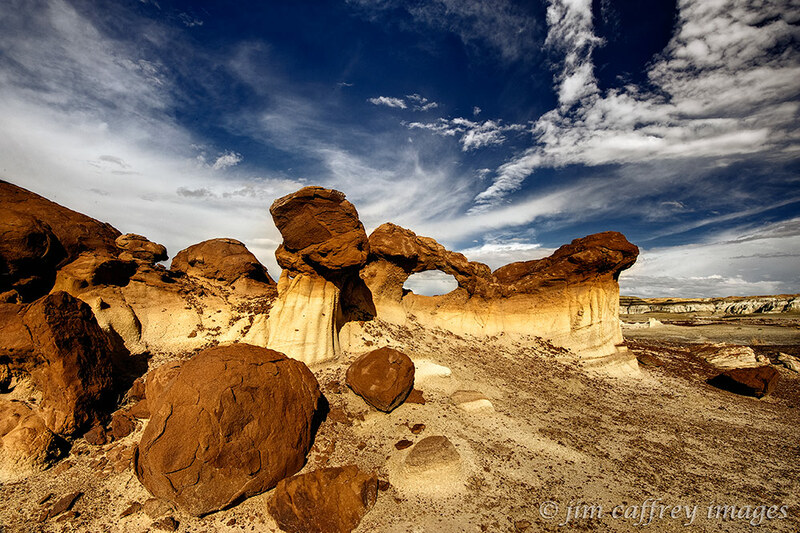 This first image was made in the Bisti Wilderness last year. 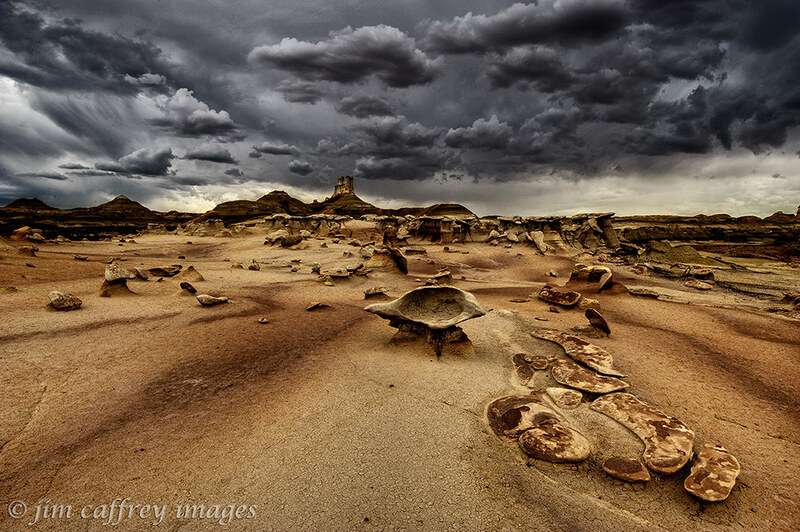 The landscape was other-worldly, and the dramatic sky added even more to that impression. In my post processing, I consciously emphasized that quality by making the HDR effect more obvious. I used a tool to help me achieve my vision. The second image is from the same trip. It was made about an hour after the first. By then the skies had cleared somewhat, and, while the landscape is by no means common, it doesn’t quite have the alien feel of the previous image. This is also an HDR exposure fusion, but I backed off on the processing; I used the technique to enhance the contrast and to make the sky pop a little more. So, two HDR images that express two very different emotions. I think I have succeeded in capturing my vision for each of them, and that is the point of art. 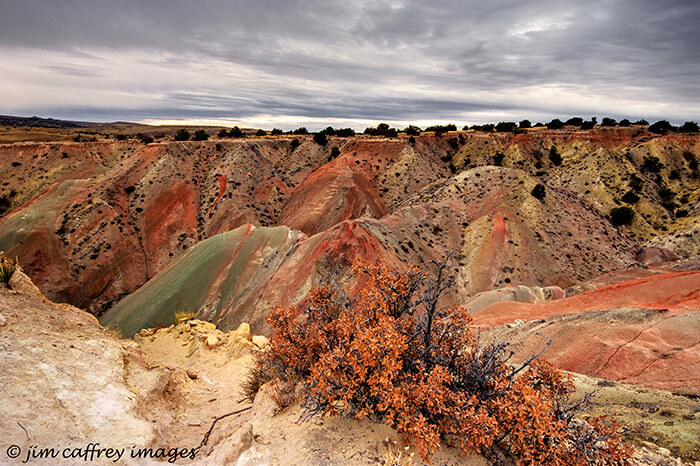 We went back to the Lybrook Badlands yesterday to do some more exploring and to come up with a format for a photo tour in the area. Just after leaving the paved road, we came across two guys parked on the side of the road. We stopped to talk and learned they are from Paris, France, and are traveling the southwest to photograph some of the more popular places. I was somewhat surprised to learn that Lybrook is on their list. They were uncertain about the weather and asked if they could tag along with us. We agreed and set out to see what we could see. 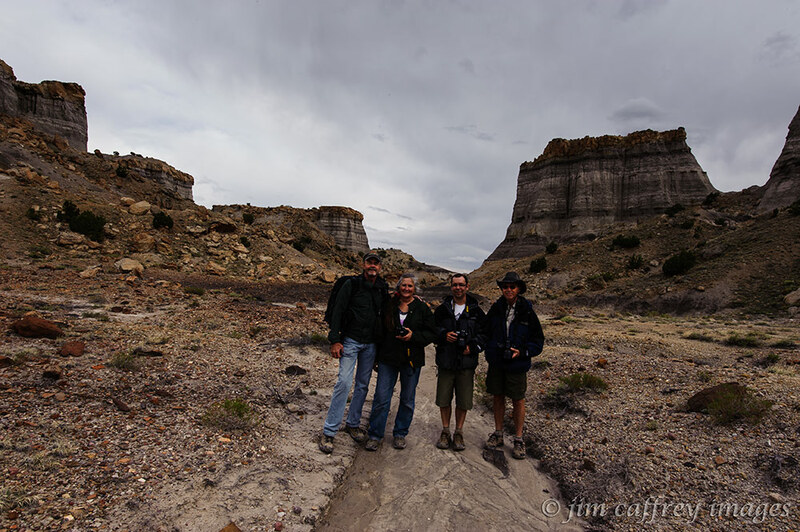 This photo shows Dominic, his son Frederic, Robin and me in the heart of the badlands. Because of the conditions, heavy clouds with intermittent rain, I decided to shoot all HDR (exposure fusion) images. I have found that this is a good way to achieve depth and contrast in this kind of light. 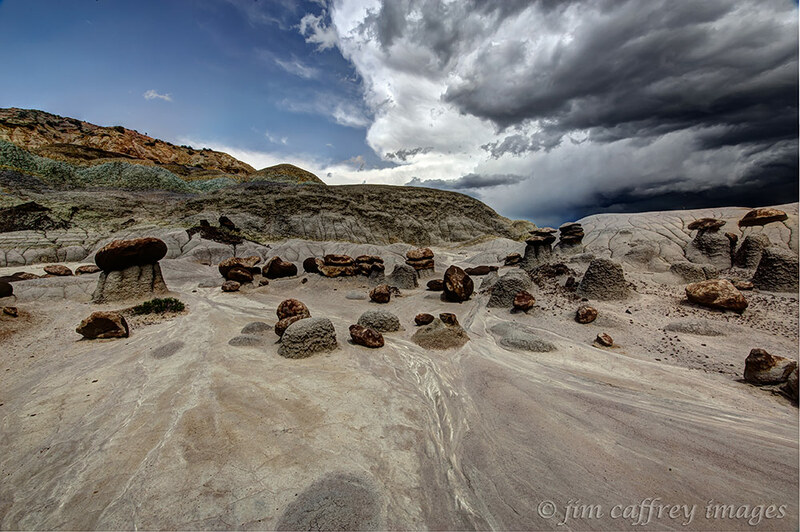 These first three images were made right on the side of the main dirt road that leads into the Lybrook badlands. 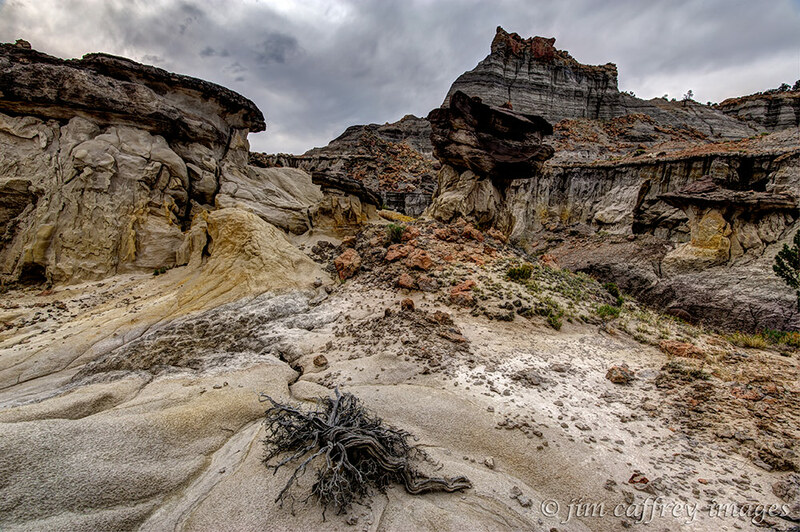 We weren’t more than a couple hundred yards from our vehicles as we photographed this small collection of hoodoos. As you can see from the stormy skies, our concerns about the weather were well founded, but we decided to continue on; we all had rain gear and the means to protect our camera gear from the elements. 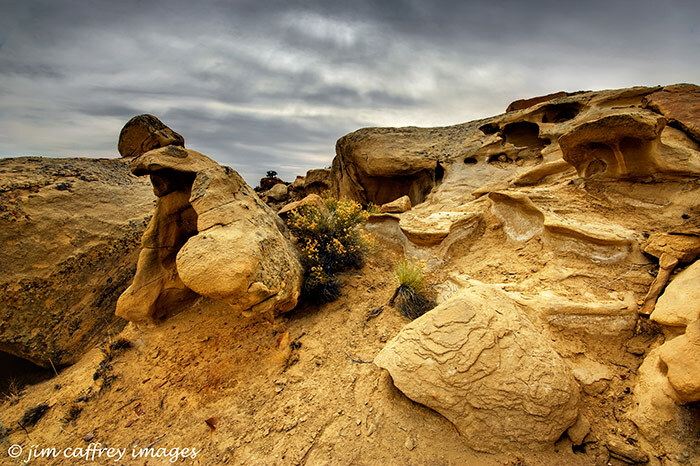 There was some blue sky as you can see in this image of what I dubbed the Hoodoo Playground. At this point, no rain had yet fallen, but I could smell it on the wind and knew it would be only a matter of time. As some of you who have read my previous blog entries may know, I am energized by this kind of weather. So, why the sudden shift in my attitude? The roads in this area have a high clay content; when it rains hard enough they can quickly become impassable quagmires. As much as I enjoy spending my time making images out here in the rocks, I didn’t relish the idea of spending a night in the Jeep waiting for the roads to dry out. 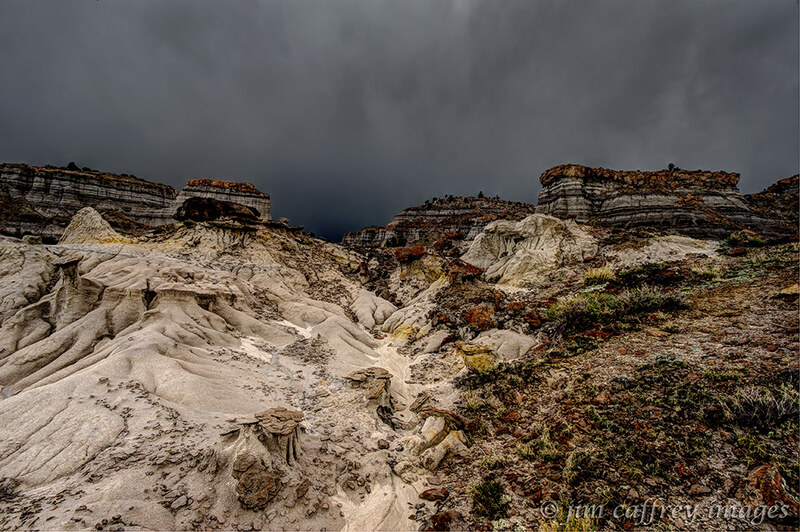 As we entered the main section of the badlands, the lightning began to flash and the thunder began to roll, but none of us showed the slightest hesitation at continuing the trek into the oncoming storm. 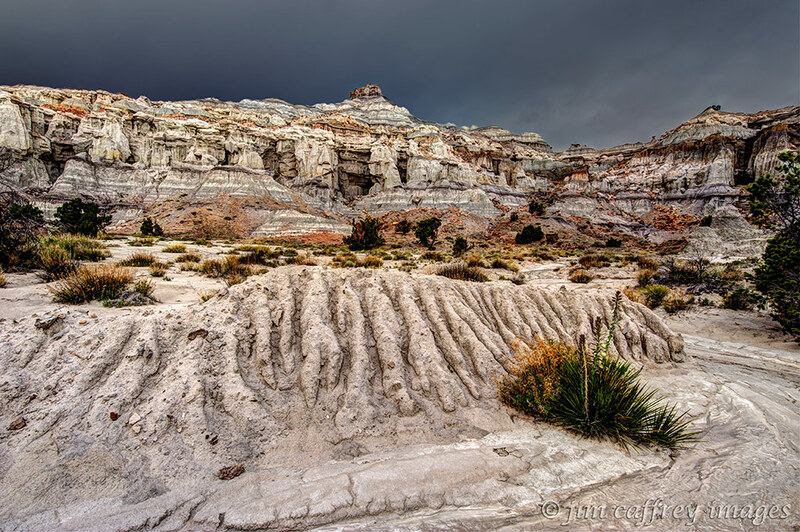 By the time we reached the place named Hoodoo Cove, the rain began to fall, not hard, but steady, so we headed back towards the parking area to be in a better position in case we needed to make a run for the cars. I couldn’t resist making one more image before we left. Even though the rain had begun to fall, there was a break in the overcast that allowed the sun to light part of the rim. It seemed somehow fitting that this dwarf Ponderosa Pine was sharing some of the rays. When we were about a half mile from where we parked, the rain let up and then stopped altogether, but the storm still moved all around us. We headed up a wash between two prominent buttes to continue our exploration. I made this image from a high point on our trail, we then continued on through the notch towards the darkest part of the cloud cover. We spent another two hours wandering the washes and climbing around the incredibly complex terrain, getting to know the place a little better. As we made our way back to our vehicles (again), I made this last image. to remind myself how fragile life is and how easily it can come to an end in a place such as this. At the same time, I was looking forward to our next trip out here. I have been taking stock of my creative drive, attempting to disassemble it and discover what makes it tick. What I have found doesn’t surprise me. I have known it all along, but putting it into words seems to help sustain it. One of the things that drives me is a love of inclement weather: snow, rain, stormy skies–I could do without wind. When the weather turns foul, my spirit soars. I get a funny feeling in the pit of my stomach, and anything seems possible. If I can throw a remote location into the mix, then I’m a happy camper. Mother Nature in all her power and glory! Both of these images were made in such locations, under such conditions. 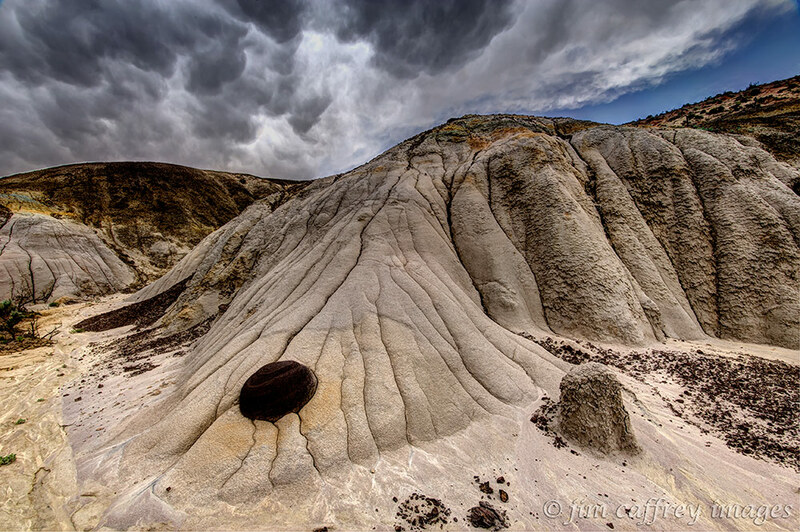 The first one is The Eagle’s Nest in the Bisti Wilderness. 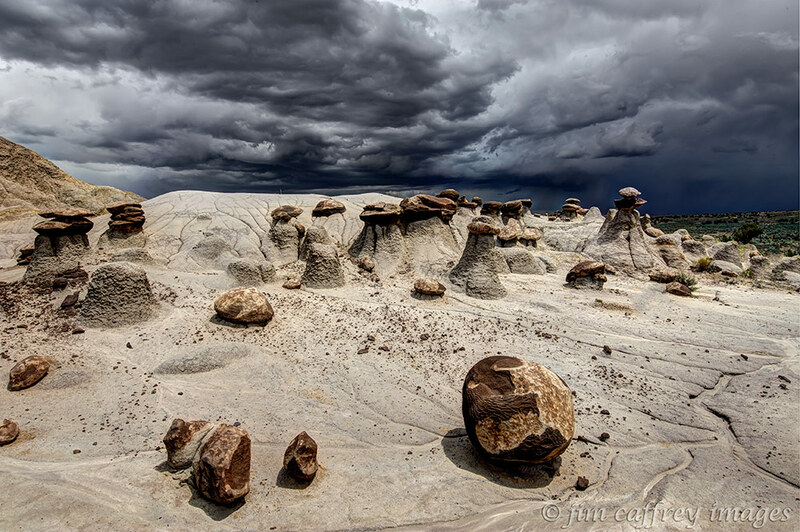 It had just started to rain, a typical New Mexico summer thunderstorm. I have to admit that I was a little concerned about being several miles from the car, in wide open spaces with lightning flashing, but the muse told me to just make the best of it. I named this image after her. The second image was made on the side of the road between San Luis and Torreon, NM–Yes you can find stuff like this just lying around next to the road, all you have to do is get out and look for it. I didn’t go more than a hundred yards from the car to make this photograph. Unlike the Bisti image, there was no immediate threat of rain and shelter was within easy reach, but that did nothing to diminish the pleasure and satisfaction I got upon releasing the shutter. Everyone knows you don’t shoot landscapes on an overcast day. The light is too flat to get any depth in your images. Right? One of the things I learned a long time ago is: Learn the rules, but take them with a grain of salt. One tool that is available to those of us who dabble in the digital realm is HDR or High Dynamic Range for the uninitiated. Normally, if you expose for the highlights in a contrasty situation, the shadows will be blocked up with little or no detail in them, and vice-versa if you expose for the shadows. 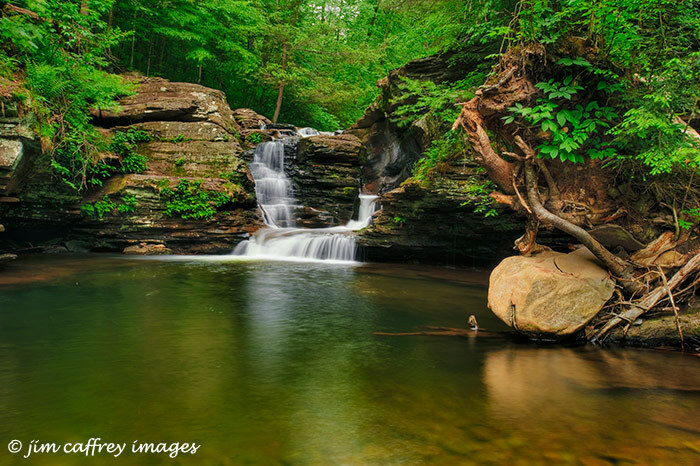 By making a number of exposures 1/2 to 1 stop apart, a photographer can then combine those images to expand the dynamic range of the photograph–the dynamic range is the spectrum of tonal variations from pure black to pure white that can be captured by a camera. Another effect that can be achieved by combining multiple images is a heightening of contrast in an otherwise flat image. As we reached the top of the mesa, the entire landscape changed and we were rewarded with incredible vistas in every direction. The light was still flat, but the visual cornucopia before us made that seem almost irrelevant. Everywhere I looked, there was an image just waiting to be captured. So, I happily started shooting, all the while telling myself that I would have to return on a better day. I realized right away that I would need to blend exposures to get the most out of the images I was capturing. I bracketed five exposures for each scene I shot. 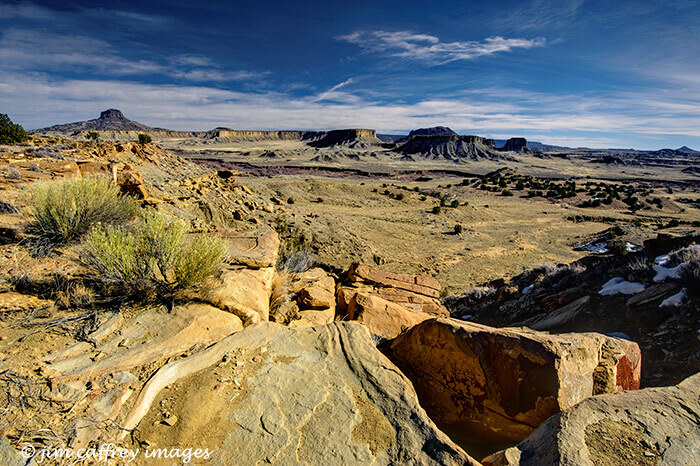 This first photo was taken near the point where we emerged from the wash on top of the mesa. 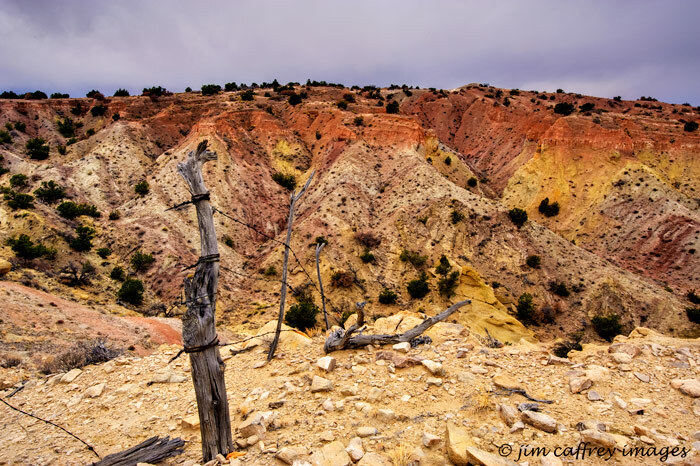 The colors were more saturated because of the overcast, and this dilapidated fence line seemed to invite me into the canyon. As we continued along the trail, we came across this small clump of rabbitbrush, which was juxtaposed against the colored bluffs in the background. The plant was a contrast in the stark landscape, but it also provided a harmonious counterpoint to the scene. We were constantly aware of the overcast and the declining sun, but we couldn’t seem to turn back. We had the “let’s just see what’s over that next rise” syndrome. Finally, we came to a high place on the trail which was our “turn back no matter what” point. This is the view looking northwest with Cabezon visible on the far horizon. A fitting climax to a wonderful journey of discovery. We slowly made our way back towards the parking area. This is the view looking west where the bike trail heads down off the top of the mesa. I was excited about the images and exhilarated by the possibilities this place holds. I also confirmed my belief that it is possible to make passable, or even great images on an overcast day. 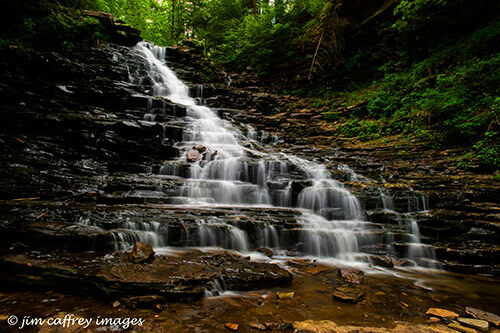 All of these photos were shot RAW with initial processing in Adobe Lightroom. They were then blended in Photomatix Pro using the Exposure Fusion tool, and final processing was done in Adobe Photoshop. The Rio Puerco begins its journey to the Rio Grande high in the Nacimiento Mountains of northwestern New Mexico. Its course wanders through San Pedro Parks and the Santa Fe National Forest before leaving public lands near the village of Cuba. 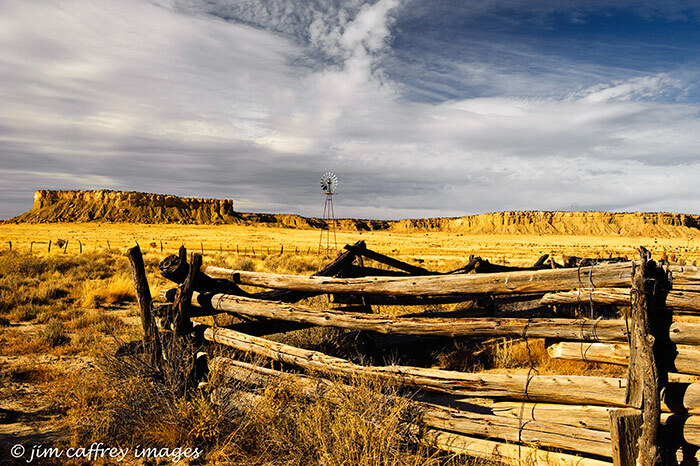 From there it follows the western edge of the Jemez Mountains past the village of San Luis, the ghost town of Cabezon, and Cabeon Peak. 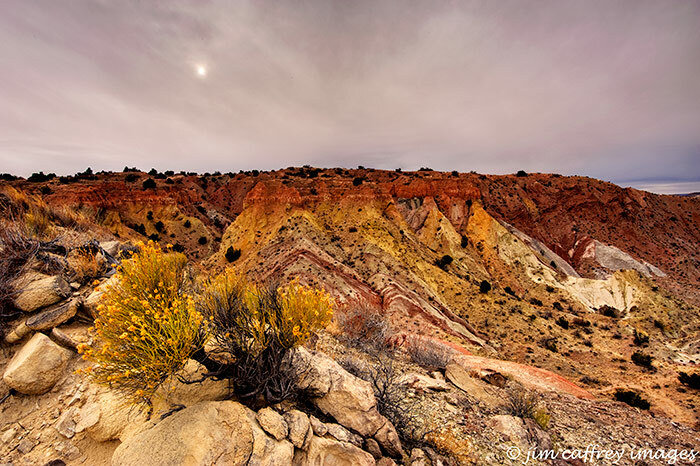 This first image was made along County Road 279 between San Luis and Cabezon. The Rio Puerco is an ephemeral flow; most of the time there is no moving water in the deep arroyo that has been carved out over the ages. When there is enough water to fill the stream, it is usually a muddy brown from the sediment being carried by the “ flood”. 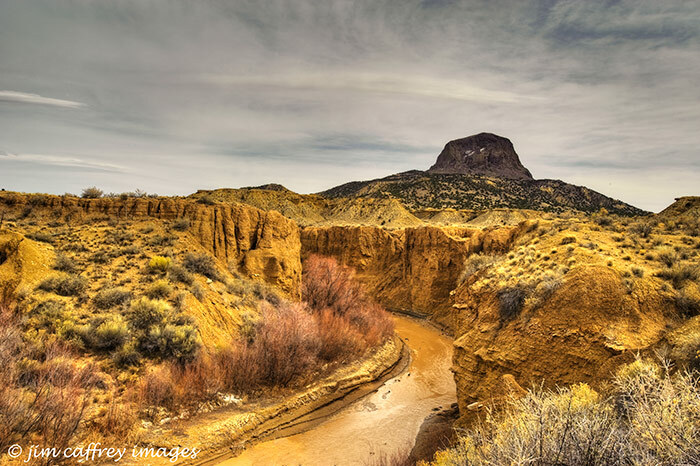 I made this image after heavy rains transformed the channel at the place where BLM road 1114 crosses the Rio Puerco west of Cabezon Peak. It is my first attempt at HDR imaging; it may be a little over the top for some tastes, but I still like the effect. A little farther south from this point, the Rio Puerco meanders past Cerro Cuate, and turns to the south. 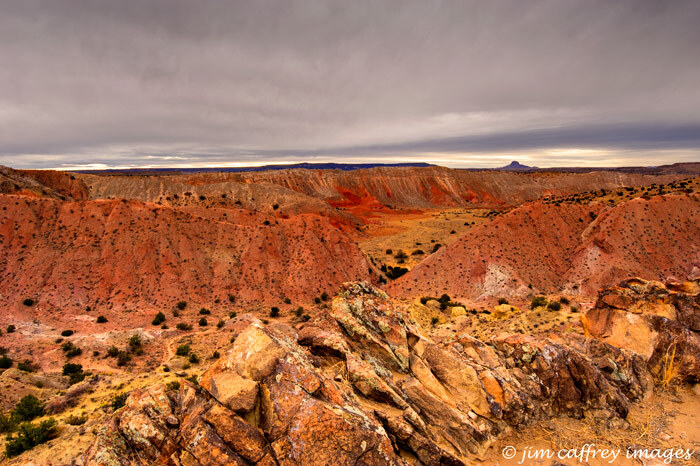 It is here that the river begins its journey through the Cabezon Wilderness Area. As the road begins to drop down to the edge of the wash, there is an expansive view of the valley with Cabezon on the left, and several other mesas and lesser peaks in the distance. From here the road crosses the Rio Puerco and continues south following the course of the streambed, which, in places is more than a mile across. Several miles beyond the river crossing is the ghost town of Guadalupe, which thrived as a farming and ranching community from the early 1900’s through the 1950s, but drought and overgrazing forced the inhabitants to leave the area. Now all that remains are some dilapidated adobe ruins and some weathered corrals. About three miles beyond the town, high on a mesa are the Guadalupe Ruins. There are about twenty rooms and three kivas at a location which commands a broad view of the valley to the north and the south. 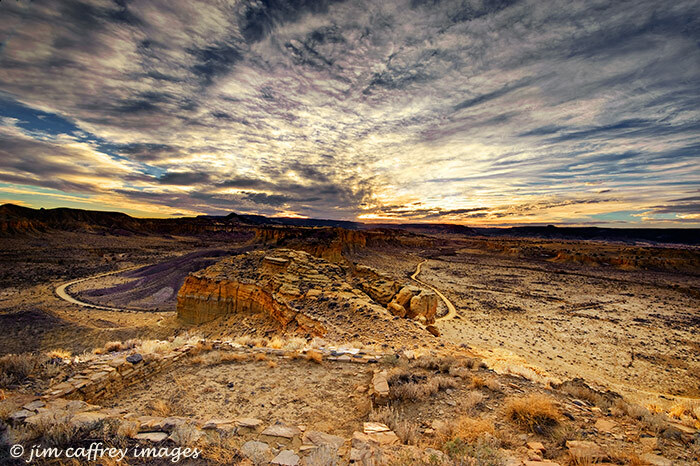 This was an outlier of the Anasazi Chacoan complex which thrived in the area from around 900–1150 CE. 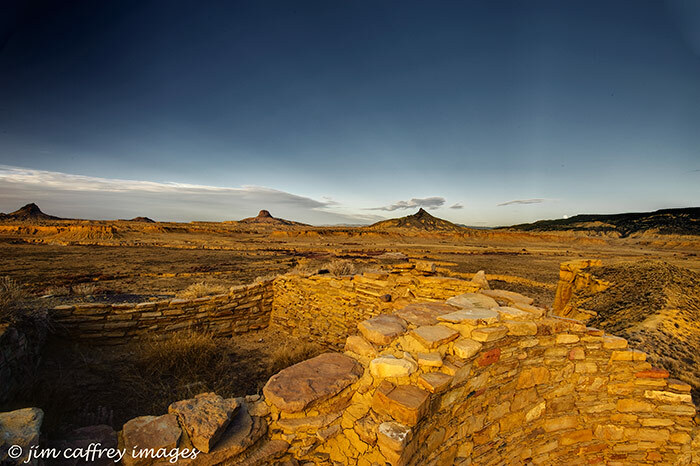 Like the people who inhabited the town of Guadalupe, the Chacoan people were also driven out by drought and resource depletion. If you choose to visit this remarkable place, remember to respect the land and the people who have lived here: take only photographs, leave only footprints.